*Day 3 will be broken down into two parts, 3a and 3b. On day 3 (the day before delivery), we'll be very busy! This is the marathon day of decorating! We'll start by getting our cakes ready for decorating. 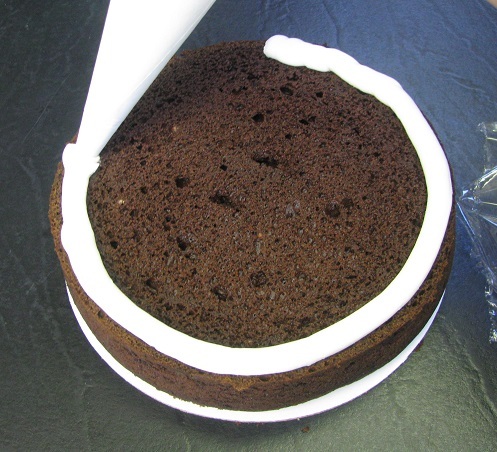 Start by leveling your cakes either with a cake leveler (Wilton leveler shown in photo), or using a long knife. 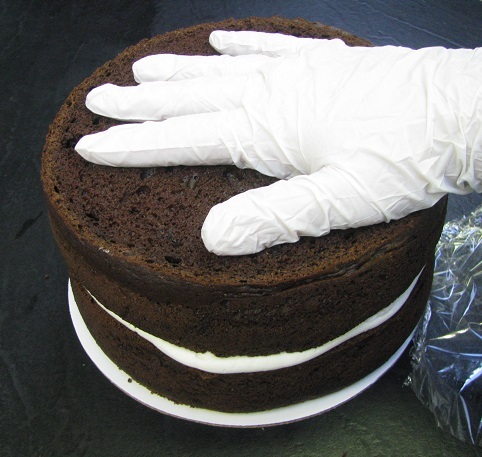 Measure how high you would need your cakes to be in order to achieve a cake that is 4 inches in height or higher (don't forget to include the filling in your height estimate). The cake shown in the photo is the 8" top tier. My 8" tier will have to layers with one layer of frosting filling in between. So to be sure I'll have a tall enough cake, I set my Wilton leveler to the number "4" setting, which will give me just shy of 2 inches of cake (about 1 7/8"). This amount of cake, plus about 1/2" of frosting will give the cake plenty of height with room to settle. 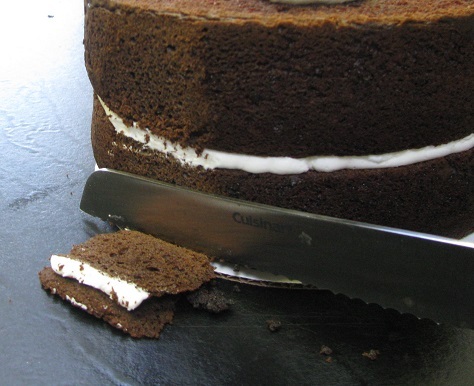 Using your leveler or a knife, cut to level your cake. Repeat with second layer of cake. After you level your cake, remove the scraps and place your cake on a cardboard cake round of the same size. Next, we're going to fill our cake with buttercream frosting. If you made your frosting on day 1 or 2 and refrigerated it, be sure your frosting has been brought back to room temperature and gently remixed in your mixer to fluff it back up. Once your frosting is ready, fill a pastry bag with the buttercream frosting. No coupler or frosting tips are needed when filling the cake. Just use a plain pastry bag, and that's it! Pipe a frosting boarder just inside the edge of the cake. 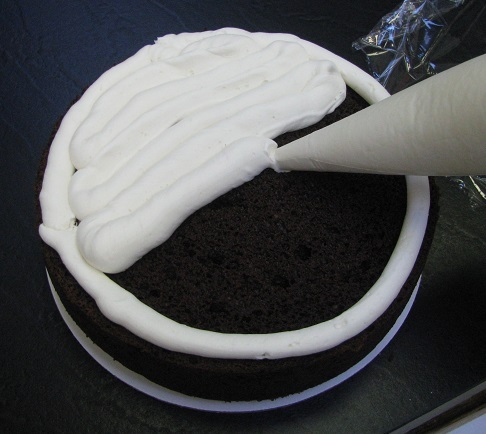 Zig zag your piping bag across the top of the cake layer to fill in the piped outline. 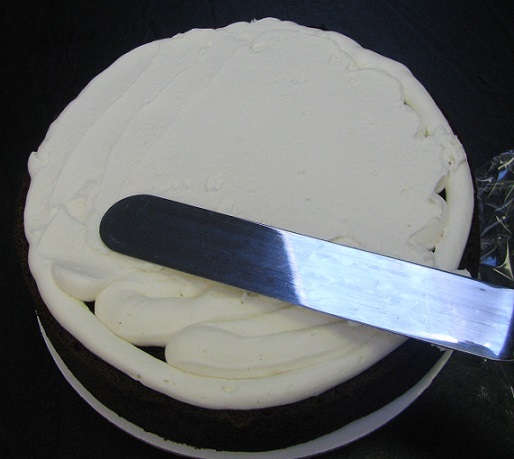 Using an offset angled spatula, smooth out the frosting filling to create a smooth even surface. Place second leveled layer of cake on top of filling. Press down on the top layer with gentle pressure to press out any air bubbles or excess filling. I estimate how heavy my fondant will be and apply pressure equal to the weight of my fondant. 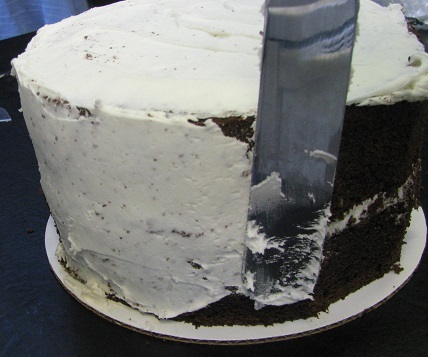 Using a sharp knife, trim the sides of the cake to create a nice even flat edge. Be sure to keep stepping back to check the general shape of your cake. 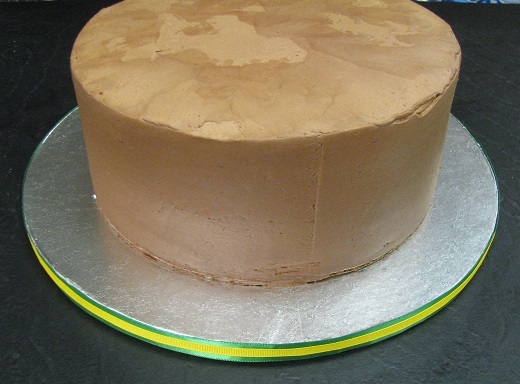 Be sure not to cut too much and risk warping the cake's shape. Beginning with the top of the cake, frost top and sides with a thin crumb coat. Try to get the frosting as smooth and even as possible. 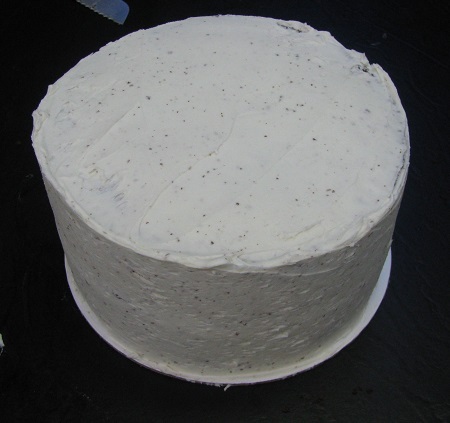 Your frosted cake may have speckles like mine. That's okay! That's why it is called a crumb coat. And this is the beauty of fondant cakes - this will all be covered by a layer of fondant. Place your cake in the refrigerator for at least 30 minutes to chill before moving on to the next step. Be sure to repeat the leveling, filling, and frosting steps with the bottom 10" layer, and be sure to refrigerate as well. After cakes have been in the refrigerator for 30 minutes, remove them one at a time and place on a large sturdy object (A Sam's Club sized can of Del Monte peaches works well! Ha ha!) to lift them off of the countertop (this will make trimming easier). 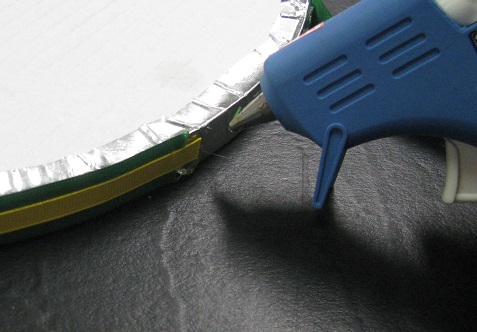 Using a good pair of scissors, trim the excess pieces off of the cardboard round. Repeat with second cake. Place cakes back in the refrigerator for at least another 30 minutes to 1 hour. This will give us a firm structure to lay our fondant over. 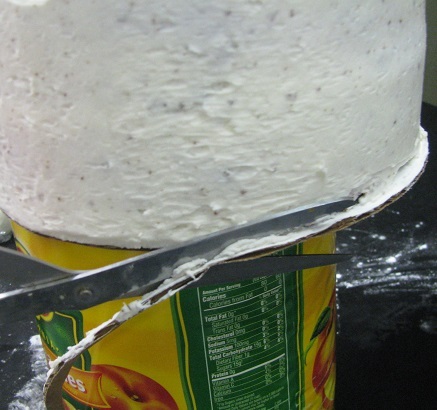 Putting fondant on a room temperature cake may cause the cake to break and fall apart. It may also cause your buttercream to bulge underneath. 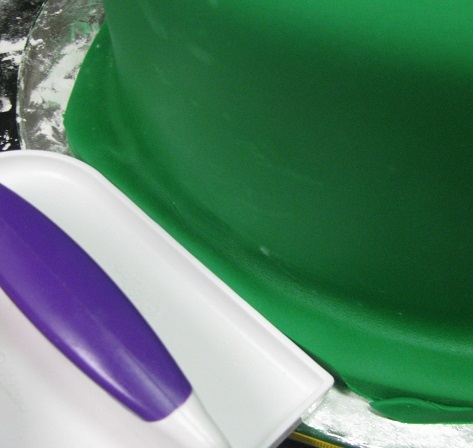 While cakes are refrigerating, begin trimming your cake base with ribbon. 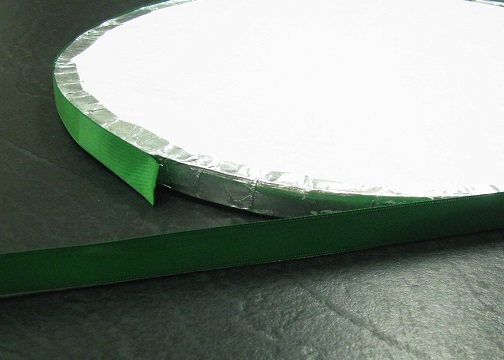 Turn your cake base upside down to help line your ribbon with the top edge of the base. The ribbon I use is a 5/8" width. This ribbon is just about as wide as the edge of the Wilton cake bases. 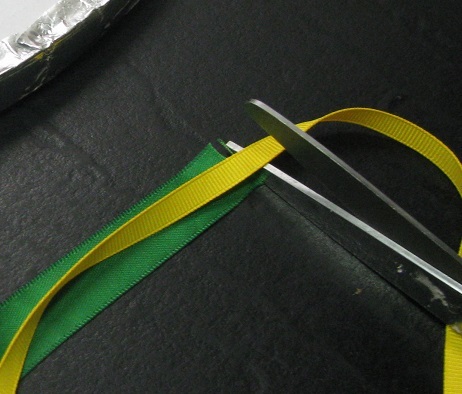 Wrap your ribbon around the cake base to measure the length you need. Trim ribbon leaving enough ribbon to overlap itself by at least 1/2". 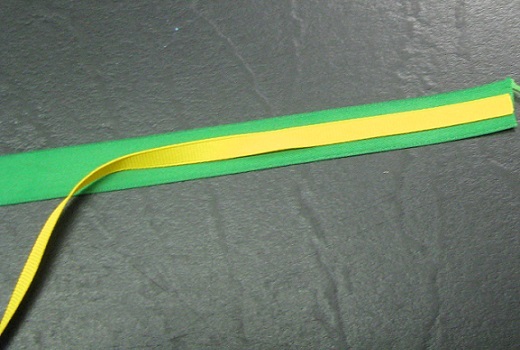 For the second smaller ribbon, hold it up to the larger cut ribbon and trim to the same length. 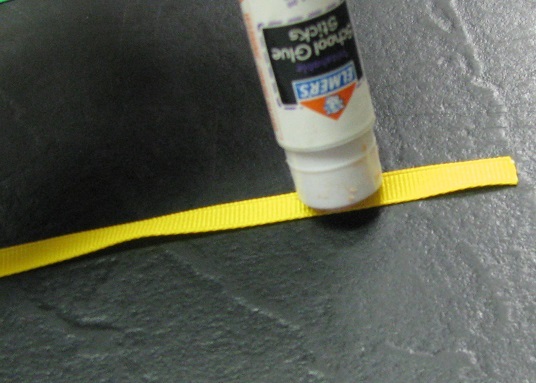 Using a non-toxic glue stick (or double-sided tape), place glue on the backside of the smaller ribbon. Line up the smaller ribbon with the larger, and glue the small ribbon onto the front side of the large ribbon. Before wrapping the cake base in ribbon, place a little bit of glue from the glue stick around the edge of the cake base to keep the ribbon in place. Using a hot glue gun, glue the ends of the ribbon to the cake base, then wrap the rest of the ribbon around until the ends meet the beginning. Hot glue the ends in place. If you're not using a hot glue gun, just use quilting pins and pin the ribbon into place. Next, turn your cake base right side up. We're about to place the large 10" bottom tier onto the cake base, so pull this cake out of the refrigerator and get it ready to glue to the base. Using a small amount of Wilton's candy melts, melt them in the microwave according to the package directions (I do 30 second increments, and stir after each time until melted). Smear a good amount of melted candy melts onto your cake base. This will help glue the cardboard (the one your cake is sitting on) to the cake base and keep it from sliding. 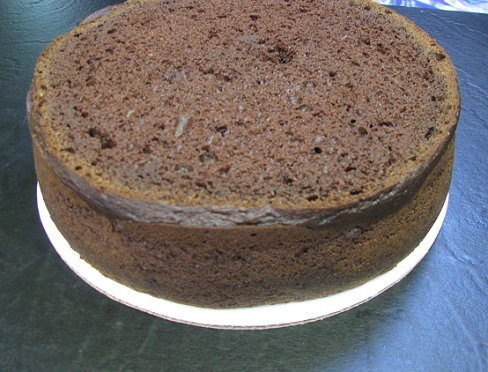 Immediately place the large cake onto the cake base being sure to center it as quickly as possible. Now it is set and ready for fondant! Place cake back in the refrigerator until fondant has been colored and kneaded. On a surface dusted well with cornstarch, knead and color enough fondant to cover a 10" cake. Color with enough Kelly Green to match the John Deere logo. 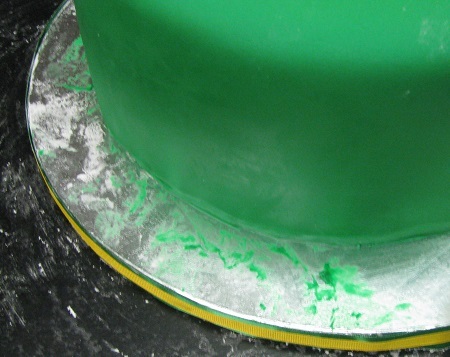 With a large roller, roll fondant large enough to fully cover the 10" round cake. My cake was 4 inches high, and 10 inches across, so I needed my rolled fondant to be at least 18 inches across all around. Roll your fondant onto the rolling pin (as shown in photo). Remove your cake from the refrigerator and lightly mist with our edible glue mixture (50% water, 50% light corn syrup). This step is not needed if you're in a climate that is humid enough to cause condensation on your cake when it is removed from the refrigerator. Just a bit of moisture is needed (whether it be natural condensation or our edible glue) to ensure our fondant sticks to the cake. Where I live, in the summertime I skip the misting step because my cakes condensate well, but it is definitely needed in the dry winter months. Holding your large rolling pin with the fondant wrapped around it, line it up with the cake and gently unroll it over the cake. Working quickly but gently, use your hands and a fondant smoother to smooth down the sides, pressing against the cake to ensure the fondant adheres to the cake. 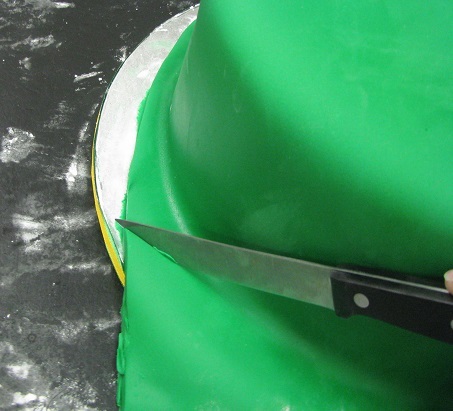 Using a sharp knife, trim around the cake, removing excess fondant. 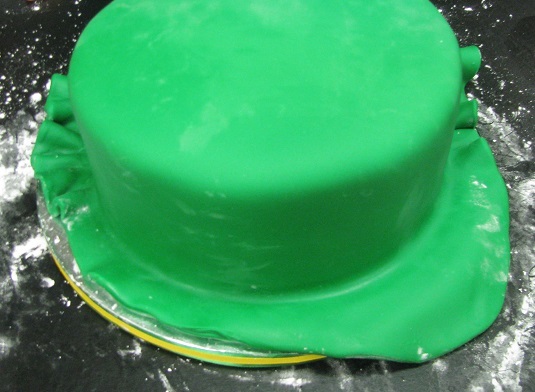 Be sure to leave about 1/4" to 1/2" of extra fondant around the cake. 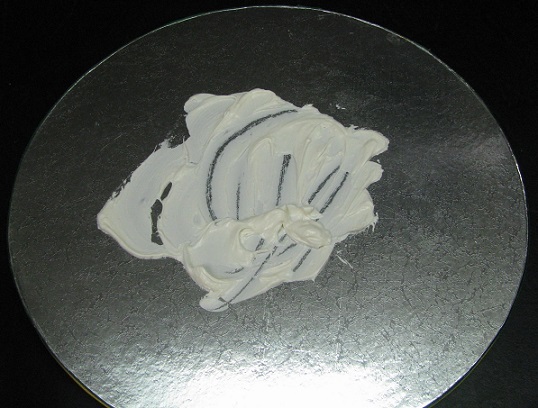 Next, take your fondant smoother and use the edge of the smoother to press the extra fondant to the cake. This will cause the fondant to seal to the bottom of the cake. 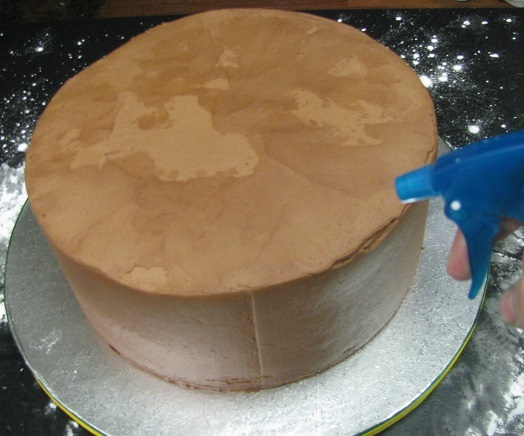 Using a sharp knife, trim the excess fondant from the cake. Try to keep it as neat as possible, but also keep in mind that this part will be covered by ribbon. Using a damp paper towel, wipe the cake base clean. There may be a neater, cleaner way to do this, and as soon as I figure it out I'll share it with you. :). If you don't use the edible glue mist, it won't be as messy. Repeat this process with the second cake tier (except color the fondant with a tiny amount of buttercup yellow - this will be the hay bale), and set aside (at room temperature).